Peat is found all over the British Isles and it is the use of peat in the Scottish whisky industry that helps to produce a drink that has a unique flavour within the world of spirits. Peat is earth that consists of grasses, moss, tree roots and soil that has become tightly compacted over thousands of years. For use in the whisky industry, the peat is cut (normally by hand) and then left to dry in the open air for approximately two weeks. After this time, the peat is collected and then taken to the distillery. Here the peat is burnt underneath the malted barley to stop it's germination. Because peat is so tightly compacted and dense, it burns for a long time and with consistent heat and smoke. This is also why it is still widely used as a domestic fuel in some areas of Scotland. The peat smoke produced contains chemicals called phenols and it is these phenols that the malted barley absorbs during this process. The level of phenols are controlled by the amount of smoke produced, the type of peat used (most of the time it is local to the distillery or cut on their own property) and the length of time that the barley is exposed to the smoke. This is one reason why different distilleries have different characteristics in their whisky. Once finished, the malt is taken away for mashing and the phenol level is measured (this level is known as the ppm - parts per million). A distillery will always have the same ppm for their malt and this value is also measured in the final spirit, although some is lost during distillation so the ppm is always lower at the end. 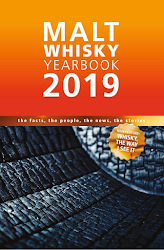 Bunnahabhain (1-2), Bruichladdich (3-4), Springbank (7-8), Benromach (8), Ardmore (10-15), Highland Park (20), Bowmore (20-25), Talisker (25-30), Caol Ila (30-35), Ledaig (35), Lagavulin (35-40), Port Charlotte (40), Laphroaig (40-43), Ardbeg (55), Longrow (55). 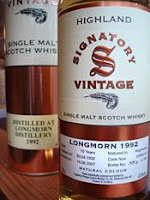 Longmorn is situated in Speyside and has built up a reputation of being one of Scotland's best blending whiskies by the blenders at most large companies. It is the main whisky that goes into the Chivas Regal range, which sells massive volumes around the world each year. As a result of this, distillery bottlings are few and far between (the most common being a newly released 16 years old). There are a number of releases from independent bottlers and this one is from Signatory Vintage and bottled at 15 years old. The colour is light and straw like. The nose is very pleasant with a lot of grassy, vegetal notes (it reminded me of a spring meadow full of grasses and fragrant flowers). Mixing with these is a pronounced citrus, zingy note (like lemon and lime zest), crisp fresh apples and some butterscotch, toffee and vanilla. The complexity found on the nose then translates well on to the palate, with these flavours combining to give a very pleasant, easy drinking whisky with a perfect level of sweetness. The finish is a disappointingly short and is quite crisp and dry with a hint of raw spirit coming through. That takes the edge off the pleasant sweetness that is present and slightly spoils the whisky in my opinion. Longmorn is relatively expensive to buy but this one is really good and well worth a try, being decently priced at just over £30. Speyburn distillery is found in Speyside. The distillery is not that well known in the UK but is one of the best selling whiskies in the USA. It is owned by a company called Inver House Distillers, who in turn belong to a parent company called Thai Beverages PLC (they are well known for the Chang beer brand). Inver House market Speyburn as a 'value for money' whisky and the core range from the distillery is small (only this 10 years old and a 25 years old). The nose is sweet and fruity (fresh apples and oranges), with some caramel and honey. There is also some spirit vapour that comes to the front, which isn't the most pleasant sensation. On the palate this whisky is nice and simple. I found elements of sweet toffee, vanilla, a hint of coconut and something nutty (almonds, I think). However, that alcohol spirit comes through again towards the end. The finish was short and disappeared almost instantly but it was crisp and pleasant with the fresh fruit from the nose prominent. This is a decent and refreshing whisky which is quite light and fruity. The only thing that spoils it is the raw spirit sensation that is present. I think this would be a great, easy drinking whisky for a hot summer's day and is pretty good value for money at just over £20. Port Charlotte is not actually a distillery. There used to be a distillery on the island of Islay called Port Charlotte, however this closed in the 1920s. Now another Islay distillery, Bruichladdich, have brought the old buildings and are renovating them so that production can start once again in 2009. Currently, only the malting house is in operation and it is here that the barley used in this whisky was malted. 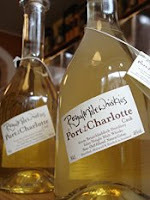 Bruichladdich are releasing limited editions of heavily peated whiskies under this Port Charlotte name. This one is a very limited release of 439 bottles. The owner of Royal Mile Whiskies, Keir Sword, purchased one cask and has chosen to bottle it now after five and a half years of maturation. There have only been three previous releases of the new Port Charlotte spirit since reopening. Two have been released by Bruichladdich (named PC5 and PC6) and one by an independent bottling company. The colour is very pale, like straw and the nose blows you away. It is packed with heavy smokiness (imagine a bonfire), damp moss, vanilla and something vegetal (reminded me of fresh leaves). On the palate, the smoke is very full on and quite overpowering but there are other flavours coming through. There is sweetness mixed with a spiciness (like cracked black pepper) and a distinct salty character. The finish is quite long with that smokiness and saltiness hanging around for a decent time. This is very good and smooth considering it is a very young whisky. To be honest, I found the smokiness a bit overpowering but once you got beyond that there were some other very interesting characteristics. This whisky can only be bought at Royal Mile Whiskies and retails for £29.99. Scotland and Ireland both have a rich heritage in the whisky industry. Both say that their whiskies are the best in the world but only you can really decide which you prefer. So what are the differences between the whiskies from these two nations? This has been the basis of many arguments! The Scots spell it whisky and the Irish spell it whiskey, with an extra 'e'. It is not known why this is. 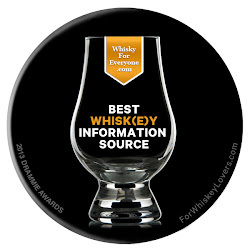 Whiskey with the extra 'e' is also used when referring to American whiskies. This 'e' was taken to the United States by Irish immigrants during the 1700s. It is here that one of the main differences occurs. Generally, Scottish whisky is distilled twice and Irish whiskey is distilled three times (there are exceptions to the rule, in both cases). Distilling three times produces a lighter and smoother spirit. The size and shape of the stills used in the distillation process are different. In Ireland, pot stills are frequently used. These are short, fat, large stills with a round base that produce softer and more rounded spirits. In Scotland, distilleries use a wide variety of shapes and size of still and this gives wider diversity (see Explain about ... How whisky is made). In Scotland it is common to use peat to dry the malted barley so that it is ready for milling and mashing. The type of peat used and the length of time the barley is drying in the peat smoke will influence the flavour in the final spirit. This gives Scottish whisky is fullness and traditional smokiness. In Ireland, they use wood in this process and this makes the spirit less smoky and lighter but again, there are exceptions. (for example, Connemara use peat and produce a very smoky range of whiskies). The Scots use malted barley in most whisky that is produced, however this is not the case in Ireland. They also use malted barley, but may mix other grains in with it. Traditionally Ireland has had a poorer economy than Scotland and barley is expensive to buy. Therefore, it is cheaper to use other grain to produce whiskey. This grain whiskey lends itself to blending and historically it has been used to make cheap blends. The oldest registered distillery in Ireland is Bushmills, which has been in production since 1608. 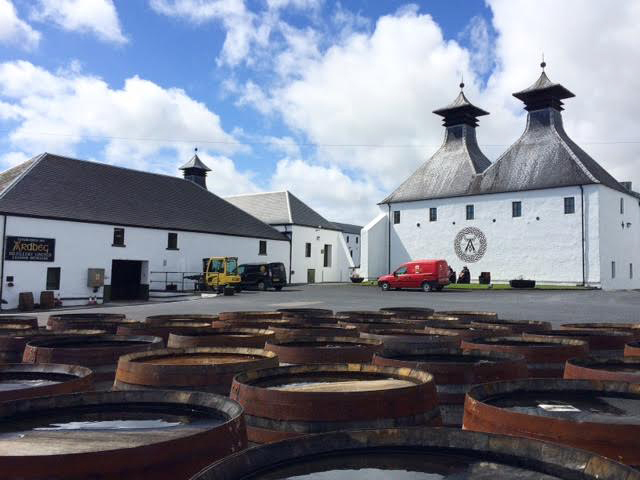 In Scotland, the oldest one opened in 1772 (Littlemill, which has now closed down). Glenturret is the oldest current distillery in operation, opening in 1775. In Scotland there are currently over 80 distilleries in production but in Ireland there are only three. These three are the result of smaller distilleries joining together. At each distillery they adher to the traditional recipes and techniques from each of the original distilleries. This gives the resulting whiskies their own individual characteristics. 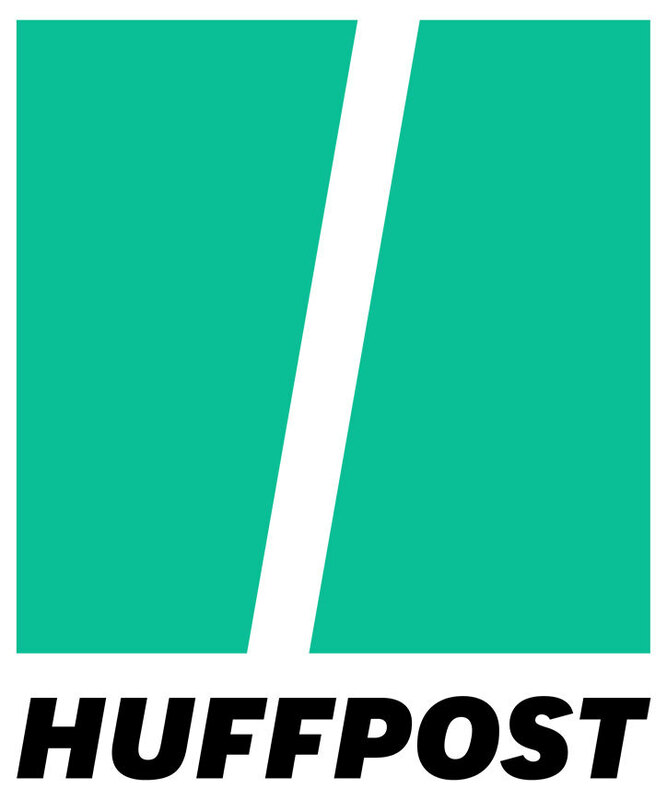 The three distilleries are Bushmills, Midleton (which produce Jameson's, Powers, Paddy, Tullamore Dew and Midleton) and Cooley (Connemara, Kilbeggan, Locke's and Tyrconnell). Glenfiddich is one of the most famous distilleries in the world and is owned by William Grant & Sons. Situated in Speyside, it is also one of the largest, producing a massive 10 million litres of spirit per year. This goes into the blending of Grant's, which is one of the world's top selling blends, Monkey Shoulder which is their new blend and the extensive range of single malts. 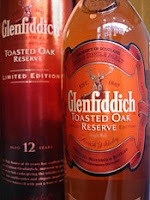 The brand of Glenfiddich is huge and it's famous three sided bottle, which was introduced in 1957, is a design icon. It is the number one selling single malt whisky in the UK, ahead of Glenmorangie, Glenlivet and Macallan. There are a number of 12 years old releases within the brand and the one I have just tried is the Toasted Oak Reserve. In this case, the whisky is matured for the 12 year period in specially prepared casks. The staves (thin oak strips) are toasted in an oven before then being assembled as a cask. This intensifies the aromas in the wood and this intensity is then transferred to the whisky during maturation. The result is a very nice whisky that has a nutty aroma (almonds and toasted pinenuts) with some interesting spiciness (cinnamon and nutmeg). I also found some zesty citrus sweetness (think of candied orange peel), stone fruit (fresh peaches or apricots) and heaps of vanilla. On the palate there are the flavours of toasted nuts, sweet caramel, those spices from the nose and vanilla. There was also something that reminded me of digestive biscuits. The finish was quite short, which was slightly disappointing. This is a good, very easy drinking whisky. It is very interesting and complex with layers of flavour. I was pleasantly surprised by it as some people have an argument that Glenfiddich and other large brands like it are boring due to their mass production. My argument would be that if something is good and you enjoy drinking it then it doesn't matter if it is popular. This whisky proves this point. 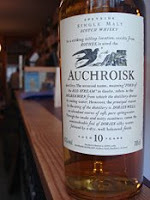 Auchroisk (pronounced ar-thrusk) is a little known distillery based in Speyside. It is owned by multinational drinks giant Diageo and is one of the newest distilleries in Scotland, only opening in 1974. The reason that it is little known is probably down to the fact that most of the whisky produced there (around 3.5 million litres per year) gets put into blended whiskies. The majority of this goes into J&B Rare, which is the second best selling blended whisky in the world. As a result, there are very few distillery bottlings around and this one belongs to Diageo's 'Flora and Fauna' range. The nose smells promising with an aromatic freshness of citrus (lemon zest), caramel, coconut and maybe a hint of liquorice. The flavour is also very fresh with the underlying taste being of the malted barley. On top of this, there is a fruitiness (raisins) and sweetness, some vanilla and toffee plus the zesty citrus notes from the nose. The finish is quite dry with a lasting maltiness and something herbal (freshly cut grass). This is good, it has a full flavour but it is refreshing and I like the dryness on the finish. 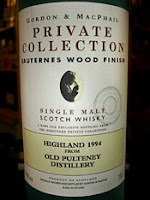 It is priced around £35 and would be a good whisky to have on a hot summer's day or as an aperitif. This is a sneak preview! A new release that is coming soon (in May sometime). We had a sample sent to the shop and I had to try. 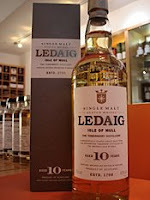 This new Ledaig (pronounced ley-chuck) 10 years old will be replacing the Ledaig Original that is currently available. This Ledaig Original is priced around £16 and offers good value for that money, however the new one has been re-branded and will be priced around £10 higher. Ledaig is not a distillery itself but is produced by Tobermory, the only distillery on the island of Mull which lies just off the west Highland coast. Tobermory is unpeated but they name their peated, smoky whiskies as Ledaig, which is the old name of the distillery. The colour is very light and the nose has a lot of perfume. It is a mix of a slight fake meaty smokiness (reminding me of smoky bacon crisps) and damp wet moss and earth. There was something slightly unpleasant and musty in there, but I'm not quite sure what. It is more pleasant on the palate with lots of sweet smokiness (think of pipe tobacco smoke) combined with a fresh vegetal, grassy flavour. This contrasts the meatiness that is present on the nose. However, there is a hint of something acrid, like burnt sugar, in there also. The finish is short and not very complex for a smoky whisky. I have to be honest and say that I was slightly disappointed by this new release. I am not sure about how well it will stand up against other smoky whiskies that will be in the same £25-30 price bracket (ie - Ardbeg 10 years old, Laphroaig 10 years old and Bowmore 12 years old). This is a whisky from Diageo's 'Flora & Fauna' range. 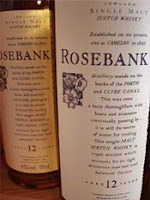 Rosebank is a Lowland distillery that was closed down in 1993. The stocks are slowly running out and therefore are becoming very desirable to collectors. It is rumoured that this is one of the last batches of stock that Diageo have. This one is triple distilled, which is unusual for Scottish whisky. Triple distillation is more common in Irish whiskies and generally produces a light, fresh spirit. The nose is very promising with grassy and fruit notes, especially citrus fruit and lemon zest. It tasted good also, very soft on the palate with those notes coming through in the flavour, along with lots of caramel and vanilla. This is excellent, a very nice tasting whisky that felt creamy and smooth in my mouth. It would definately be worth investing in a bottle, as stocks are starting to dwindle and the price is increasing. This is the brand new release from Balvenie and is replacing the 10 year old 'Founder's Reserve' in their range. Balvenie is found in the Speyside region. We have only just received this in the shop, so I was interested to taste the difference between this and the 12 years old 'Doublewood' that it will be sold alongside. The 'Doublewood' is matured in a bourbon cask and then transferred to a sherry cask, whereas the 'Signature' is matured in two different types of bourbon casks and then a sherry one. I found the nose quite complex and picked up vanilla and woody notes from the bourbon casks, followed by a sweetness (imagine dried fruit and raisins). All these flavours were present on tasting, along with a very nice creamy feeling. However, although it was nice, the finish was too dry and very short. There was too much bourbon influence and not enough sherry influence, there is a better, smoother balance in the 'Doublewood'. The 'Signature' is a decent whisky, but I feel it's not different enough from the other 12 year old they have and can't really work out why they are replacing the 10 year old with it. 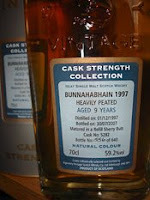 This is a nine year old whisky from Bunnahabhain, a distillery on the island of Islay off the west coast of Scotland. They have produced a limited amount of heavily peated spirit, which is completely different to the regular distillery style. It is released by Signatory Vintage, who are one of the major independent bottling companies. This whisky is an attack on your senses from beginning to end. 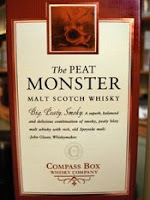 Some people like these peaty whiskies and others don't. The nose of this smacks you in the face. I got sweet, smoky aromas with elements of meat (probably bacon), oil, leather and earth. It was like sticking my head in to a cross between a bonfire and a barbeque. The taste was equally as powerful, however the alcohol level was very high at just under 60% ABV (most whisky over 50% is classed as cask strength). On adding water, which is a common practice with most cask strength whiskies, a sweetness came through from the sherry cask that it had been matured in. Also coming through was the salty, brine flavour that is common with regular Bunnahabhain whisky. This sounds unpleasant, but marries surprising well with the other elements to give a very good whisky. Most cask strength whiskies are expensive (generally prices start around £50) but I think this one is good value at just over £40. Miltonduff is a distillery in Speyside and most of the whisky distilled there goes into blended scotches. This makes official bottlings fairly hard to come by. 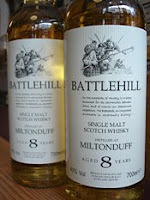 This one is a young whisky released by Duncan Taylor in their 'Battlehill' range. Duncan Taylor are one of a number of independent bottling companies who buy casks of whisky from different distilleries and then choose when to release them. This makes these whiskies more limited and by buying independent bottlings, you can try rarer whisky at reasonable prices. This one had a fruity (citrus) nose but with an interesting sulphur undertone. This sounds horrible I know, but it wasn't a bad rotten egg smell but was subtle, like a coal fire burning in the distance somewhere. It was very creamy and refreshing to taste with those citrus zingy notes coming through well. This was good and is excellent value for a price of under £20. Mortlach is a distillery that is found in the town of Dufftown in Speyside. It is owned by multi national drinks company Diageo and produces whisky that primarily goes into the Johnnie Walker blends. As a result of this, releases from the distillery under it's own name are reasonably hard to find. This particular one is from the 'cask strength' range by Signatory Vintage, who are one of the main independent bottling companies in Scotland. 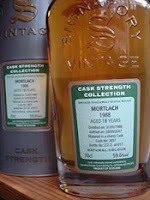 Independent bottlings are important in the cases of distilleries such as Mortlach, because they make whisky available to the consumer that may have been allocated elsewhere. The nose smells very promising, being light and buttery with hints of vanilla, dried fruits (raisins, orange peel and prunes) and some floral notes (heather or honeysuckle, I couldn't decide). However, on tasting this blows your mouth away. With a very high alcohol level of 59.6%, this mugs your taste buds and lips and burns them, meaning that it is hard to taste anything through the assault. I added some water to lower the alcohol level and the experience became instantly more pleasant. It becomes buttery with those dried fruits that were detected on the nose (a classic sign that it has been matured in a sherry cask), with added flavours of spices (like nutmeg and cinnamon) and caramel. The whisky feels creamy in your mouth but I found the finish was too dry for my taste. Overall, it was a good whisky but it left me a little disappointed. This is a limited bottling and retails at around £55-60. Linkwood is a distillery on the outskirts of Elgin in Speyside. It is owned by multi national drinks company Diageo and has a reputation among connoisseurs for producing very good whisky and has a bit of a cult following. Most of the whisky produced at the distillery goes into blended whisky, therefore actually distillery releases are few and far between. 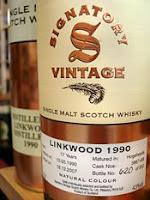 This one is from Signatory Vintage, who are one of Scotland's largest independent bottlers, and is 17 years old. The colour was extremely light (like straw). Considering the age of the whisky I would expect it to be darker. The nose is good with hints of vanilla, coconut, green apples and peaches (unripe ones, though). On the palate, this whisky is very light and delicate. There are fresh leafy and grassy notes, with some vanilla, unripe stone fruits and toffee coming through. However, there is an oily flavour on the finish that reminded me of smelling petrol and also something else that resembled hard wood or furniture polish. This made the finish very dry but it did cleanse the palate well. This whisky was easy to drink but just not that memorable, and I am not sure that I liked that finish. I think it would be a great summer drink, a good palate cleanser after a meal or a good mixer with soda or ice. It is refreshing and if you like a good gin and tonic then you may enjoy this. I received this bottle as a Christmas present, it is a very limited release from The Wine Society in their 'Exhibition' range. They buy casks from various distilleries and then release bottlings from these casks to their members. There is no distillery named on the label but the region is named (the island of Islay). It is rumoured that this whisky is from Bowmore. The colour is very rich, dark and golden and the nose is very pleasant. 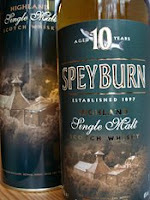 There is the smokiness that you associate with most Islay whiskies, but it is more subtle due to the age of the spirit. There is also a very interesting sweetness coming through that reminded me of citrus fruit (think of sweet oranges). The taste is very good. The smokiness does not overpower the other flavours and is lighter than I expected, making me think of a small open fireplace burning (the ash/embers, I think). Again there is the sweet citrus note but it is joined by other vegetal elements (it's earthy and mossy, which probably comes from the peat used in smoking the malt grains). Some Islay whiskies can have a very full on meaty flavour, but this was surprising and refreshing to the palate. The finish is very enjoyable and long. All the elements linger around for ages, with maybe a slight bitterness coming in right at the end. This whisky is a very good example of how smoky whisky can become rounded and mellower with age and I think even people who don't like the really smoky whisky flavours, would enjoy this. 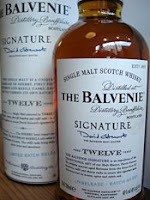 It can only be purchased from The Wine Society website and the price of £30 for a 21 year old whisky, is a bargain. I would be pleased to get another bottle as a present! 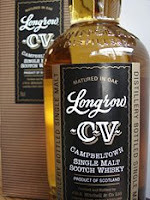 This is one of the year's long awaited new releases from Longrow. It is produced by the Springbank distillery, which is located on a spit of land on the west Highland coast called Campbeltown. Longrow is Springbank's heavily peated version of their whisky. The main differences from the regular Springbank whisky that you can buy, other than the levels of peatiness, are that Longrow is only produced for a short period of the year (approx 1 month) and it is double distilled, whereas Springbank is distilled two and a half times. 'CV' stands for 'Curriculum Vitae' according to the distillery and is named as such because it contains different ages of whisky, with the oldest being 18 years old and the youngest being 6 years old. I don't quite understand that logic, but anyway! The nose is pungent, smoky and earthy (something like sweet charcoal smoke). When tasted, there is an initial crispness that hits your mouth that reminded me of cider/apples. However, the smokiness hits almost straight way. This didn't overpower the other flavours, in fact more developed. I got some vanilla, a hint of coconut, some menthol and pine needles. This pine element sounds strange, but it was there in the finish and reminded me of disinfectant. This spoiled what was otherwise a pleasant whisky. It is decent value, being priced around £30. I would try it if you find very smoky whiskies too much, as the smokiness is there but is more subtle and allows other interesting flavours through. Old Pulteney is a distillery located in the far north east of the Highlands, near Wick. This whisky is in our collection thanks to a 'Wow' moment that we recently experienced at the Whisky Live show in London. We just had to buy a bottle after that. This particular version is released by Gordon & Macphail, who are an independent bottling firm based at Elgin in Speyside. Like all bottling firms, they release different ages or different cask finishes of whisky and this is an excellent example. It has been released as a 12 year old and has been finished in a Sauternes wine cask. Sauternes is a sweet dessert wine from just south of Bordeaux in France. This whisky is limited to only 2050 bottles and this offers a good opportunity to economically try a rarer whisky, as it is priced at just under £40. The dark yellow colour is amazing as is the nose which is rich, sweet and intense, filled with the smell of dried fruit (raisins, apricots and pears). When you taste, it feels buttery, creamy and thick in your mouth with all the previously mentioned dried fruit, orange peel and some salty flavours hitting you palate. Saltiness is a common characteristic of Old Pulteney and whisky like this is sometimes referred to as having a 'maritime' feel. This occurs when the distillery is located close to the sea and the casks absorb some of the sea air during maturation. The finish is long, rich and fruity. The marriage of all of this gives an intense experience, which some may find too sweet, rich or overpowering. However, these are the exact reasons that we like it, as the influence of the sweet dessert wine cask gives a whisky unlike anything else that we have tasted to date. The names of most Scottish whisky distilleries are determined from their location. Many of these are derived from the Gaelic language and a lot of people find them hard to pronounce. I have heard some very funny attempts at some of the distillery names, so I thought it would be a good idea to tackle some Gaelic pronounciation. Some are easier than others. Below is a list of some of the trickier ones, with the correct pronounciation in brackets. Hopefully this will help understand a bit about how the Scottish language works. Allt-a-bhainne (olt-a-vane), Auchentoshan (ocken-toshun), Auchroisk (ar-thrusk), Balvenie (bal-vaynee), Bruichladdich (brook-laddie), Bunnahabhain (boo-na-harvun), Caol Ila (kool-eela), Caperdonich (kappa-doe-nick), Cardhu (kar-doo), Clynelish (kline-leesh), Craigellachie (craig-ella-key), Dailuaine (dal-yewan), Edradour (edra-dower), Glen Garioch (glen-geery), Glenallachie (glen-alla-key,) Glenfiddich (glen-fiddick), Glenglassaugh (glen-glassoff), Glenmorangie (glen-morrun-jee), Glenugie (glen-oojee), Lagavulin (laga-voolin), Laphroaig (la-froyg), Ledaig (lay-chuck), Pittyvaich (pitty-vek), Poit Dhubh (posh-doo), Strathisla (strath-eye-la), Tamdhu (tam-doo), Tamnavulin (tamna-voolin), Te Bheag (chay-vek), Teaninich (teen-inik), Tomintoul (tom-in-towel), Tullibardine (tully-bar-dee). This is a vatted whisky consisting of different whiskies from different distilleries, that are aged between 10 and 15 years. The two main distilleries involved are Caol Ila from the island of Islay and Ardmore from the highlands. Caol Ila is generally regarded as one of the smokiest whiskies available, while Ardmore whisky is rich and sweet but with some smokiness (this is unusual for a Highland whisky). So from this description, you can probably guess what this is going to be like. The colour was very light, considering the ages of the spirits involved and the nose takes your breath away. 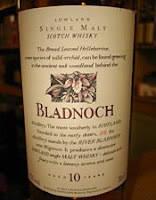 It was very peaty, earthy and smoky (imagine a bonfire) with meaty notes (like the smell of an old leather jacket). However, there was a rich sweetness that battles through this that reminded me of vanilla mixed with honey. The taste was very intense. There was a crisp sweetness that hit the front of my tongue in the first instant and then the smokiness takes over. This smokiness is sweeter on tasting than on the nose, with less of the meaty quality. This whisky has a long, rich finish as the smoky, earthy flavour slowly fades away. I found this to be quite refreshing for a very smoky whisky and think that this may be down to the balance of the Caol Ila with the sweeter Ardmore. This shows the skill of the blender and as a result it is very interesting in character. This is one of the best examples of a blend or vatted whisky that I have tasted so far, however it is a bit more expensive than most other at around £30. 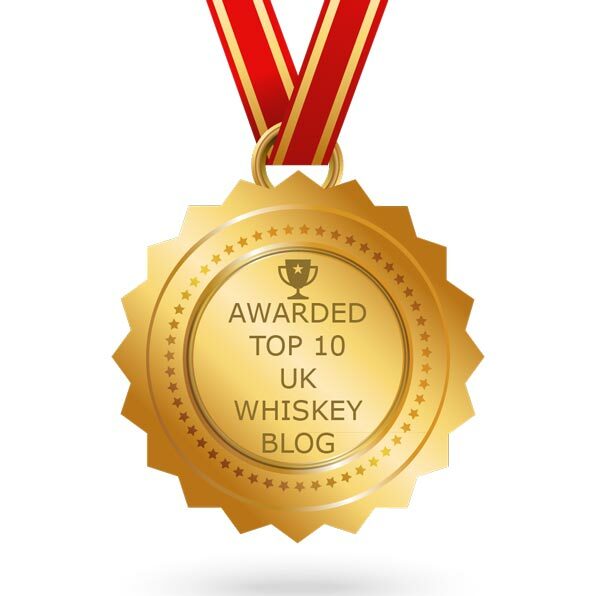 Having said that, Compass Box whiskies are not as common as other brands of blended whisky. Independent bottling companies have expanded the whisky market greatly by making a larger selection of products available. These companies buy casks from the distilleries or send them empty casks to be filled and stored and then carefully choose when to bottle and release them. This gives you a product that has all the original distillery character but that is also unique, as it may be released at a different age to that of the original distillery's whiskies. The independent bottler may also finish the spirit in a different cask to the original distillery, therefore creating a unique whisky. Sometimes, the independent bottlers will only buy a single cask from a distillery, therefore leading to a very limited quantity of final bottles. Generally, these bottlings offer good value by being priced similarly or cheaper than the original distillery bottlings and it is an excellent way to try different or rarer whisky. The majority of distilleries will be named on the independent bottlings, along with the age or year of distillation and other information such as which cask the spirit has been matured or finished in. If it is a limited bottling, it will also show the number of bottles available. There are a few distilleries that insist that their name does not appear on any independent bottlings and in these cases, the bottles can be labelled with the region of production. Names of independent bottling companies to look out for include Adelphi, A. D. Rattray, Cadenhead's, Compass Box, Gordon & Macphail, Douglas Laing, Signatory Vintage and Duncan Taylor. Generally, they can only be bought in specialist retailers. Cask strength is a term generally used for whisky that has an alcohol level above 50% ABV. Many people believe that this is whisky in it's true form, as it is bottled directly from the cask with nothing added. Most whiskies have spring water added before bottling to bring the alcohol level down to between 40-45%. This is known as 'cutting'. This makes the whisky more approachable to the majority of drinkers, who find higher alcohol levels too intense or strong. However, others drink cask strength whisky for these very reasons and the intensity of the flavours. Here's a little known whisky secret ... An easy way to find out if a whisky is cask strength or not, is by shaking it in the bottle. If the bubbles disappear almost instantly, then the whisky has an alcohol level below 50% and is not cask strength. However, if the bubbles take longer to disappear, then the whisky is over 50% and cask strength. This Lowland distillery has only reopened a couple of years ago, having previously been owned by multi national drinks company, Diageo. 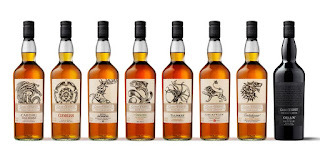 the 'Flora & Fauna' range covers a number of Diageo's less well known distilleries. The colour is light and the smell or 'nose' is very good. It smells fresh and slightly grassy with an interesting touch of saltiness. When tasted, it was very refreshing on my palate. I got an instant zingy freshness that was light, malty and fruity (imagine green crisp apples). However, after time there was too much raw spirit coming through, which can happen especially with young whisky. When this happens, the alcohol flavour overtakes or overpowers the other flavours that are being experienced. I added some water to try and combat this but it became too bitter and woody for my taste. A decent, light refreshing whisky (without water).